Fortunately we can come back to you with a story that had a “good ending”! 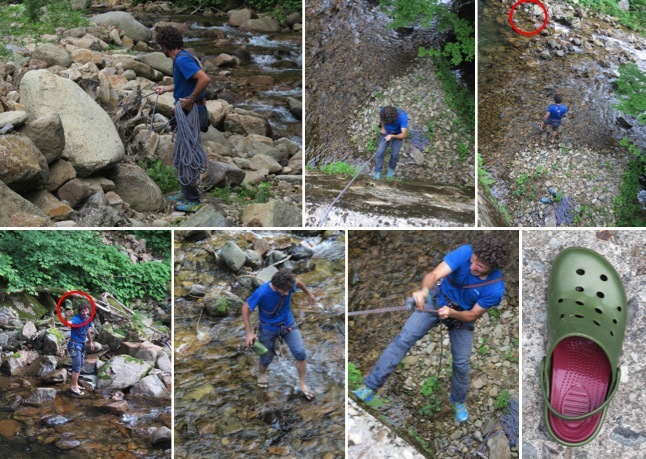 After a complicated canyoning rescue operation, we could recover the lost Marco’s Hand Clap. Marco lost one of the family component during a bath section in a nice river in the central Japanese Alps! Here below some pictures of the rescue operations! This entry was posted on Saturday, June 29th, 2013 at 2:34 am	and posted in Uncategorized. You can follow any responses to this entry through the RSS 2.0 feed. One good reason to use your climbing equipment after some time resting inside Frida! Congratulations you made it including the missing sneaker!